Bamm! Hot Habanero BBQ rub is has all the taste you expect in a great BBQ rub plus super-hot burn from habanero peppers. 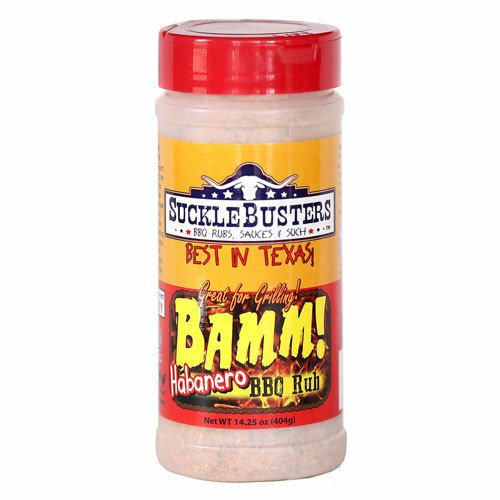 The base rub tastes sweet and salty, then you begin taste and feel the slow burn from the habanero pepper that keeps getting hotter and hotter. It makes you want more! The BBQ rub is not for the faint of heart, it is for folks who like it super-sweet and super-hot! If you like it Hot, then this awesomely hot and sweet BBQ Rub for you. Bamm! Habanero BBQ Rub is great on anything - our favorites are chicken, pork and fish. Sprinkle it on and feel the pain. All-Natural, NO MSG. Naturally Gluten Free.